Almost half way through the year and May has seen a slightly top-heavy Deal Watch table with two corporate acquisitions with headline values of over $8bn. However, this month saw the fewest number of corporate acquisitions in the year to date, when compared to the previous months in 2015. The aggregate value of the top 20 deals was also down from the previous month where we reported the high value AbbVie/Pharmacyclics acquisition at $21bn. Topping the table with a headline value of $8.4bn was the acquisition of Synageva BioPharma by Alexion. The deal comprises cash and shares with a premium of 140% over the closing price on 5 May. This agreement brings access to Kanuma (sebelipase alfa) which is in registration for the treatment of lysosomal acid lipase (LAL) deficiency. The number of late stage opportunities in the rare diseases space is fairly limited so this represents a significant step forward for Alexion. Staying with rare diseases, Cortendo closed a deal with Antisense Therapeutics for ATL 1103 in acromegaly. Making an upfront payment of $5m, the deal carriesmilestones of $105m for the phase II-ready asset. With a similar headline value to Synageva/Alexion and building on its acquisition plans was the purchase of Par Pharmaceuticals by Endo. It has proved a busy year for Par with the Auxillium acquisition closing in January followed by the on-off planned purchase of Salix (Salix was successfully sold to Valeant for $14.5bn in February). Clearly the money was burning a hole in the Endo shareholders' pockets and this will consolidate the company's position in the generics field. Staying with the generics topic, the ongoing saga of Teva-Mylan-Perrigo has gone quite quiet with the various parties indicating that the negotiating gap is fairly far apart. There will no doubt be lots of back room activity for example, the Mylan investor, Paulson & Co has increased its stake to 4.5% - some 22 million shares. Wellington Management also followed suit adding a further 12.5m shares moving up to a 6.5% share of the business. But clearly Teva has had some other issues to consider. One of the potential down sides of acquisitions is that significant risks may be acquired with the assets. This has proved to be the case following Teva's purchase of Cephalon in May 2011 for $6.2bn which brought Provigil (modafinil for sleep disorders) into the portfolio. The product has been the subject of an investigation from the US Federal Trade Commission (FTC) and although not usually reported in Deal Watch, the $1.2bn settlement is noteworthy recognising the higher price paid by patients due to the delayed availability of generics. This is not the first such case for Teva, as the FTC also filed suit last September for an alleged pay for delay relating to AndroGel. This will all be good practice for Teva as there will be considerable antitrust activity if the Teva-Mylan deal goes ahead. Another feature which has emerged strongly in the deal landscape is the use of options and this month saw two companies move ahead and exercise their option rights. Firstly, Boehringer Ingelheim progressed its deal with the Australian company Pharmaxis acquiring PXS4728A in phase I for non-alcoholic steatohepatitis.PXS4728A is an oral treatment which inhibits SSAO/VAP-1. Valued at $600m, Boehringer Ingelheim has paid an upfront fee of $31m with a further $63m in milestone payments linked to the start of phase II and phase III clinical trials and a further $160m in regulatory milestones. Similar payments are available for any second indication that emerges from the programme; royalties are payable in the high single digits. Emanating from the initial co-development agreement signed with Selecta in 2012, Sanofi has exercised its option to an exclusive licence to develop an immunotherapy for the treatment of coeliac disease. Selecta is eligible to receive fees up to $300m per allergen indication (a maximum of three giving a total deal potential of $900m) with double digit royalties on commercial sales. With the high number of oncology deals that have closed this year so far, the trend simply continues with a further five deals being concluded this month. Interestingly though, it is not always the major players as evidenced by the deals between bluebird bio with Five Prime Therapeutics and Editas with Juno Therapeutics. The Editas/Juno collaboration brings together the Editas CRISPR/Cas9 genome editing capabilities with Juno's expertise in immuno-oncology. Editas received an upfront of $25m with a further $22m in research support; milestones of $230m per programme plus tiered royalties. It was a busy month for Juno who also closed a deal with Fate Therapeutics. Financial terms include an upfront of $5m with Juno buying equity of $8m, $50m in milestones with low single digit royalties. Juno will also provide funds for the 4 year collaboration. This collaboration focuses on identifying small molecules to modify T cell product candidate to improve therapeutic potential. Last in its hat trick of deals this month was Juno's acquisition of Stage Cell Therapeutics for an initial payment of $59m with $150m in success payments. The acquisition provides access to transformative cell selection and activation capabilities. Almost all of the companies with oncology interests had bought into CAR-T / immunotherapeutic approaches with the possible exception of Lilly. This omission was rectified this month as Lilly closed a deal with BioNTech. The research collaboration will identify novel tumour targets; BioNTech received a $30m upfront fee with a further $300m in milestones plus tiered double digit royalties. In addition Lilly is making a $30m equity investment. 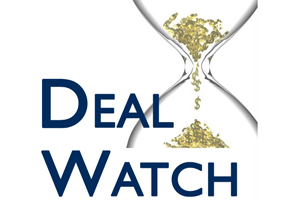 Lilly has recently returned to the Deal Watch commentary and May saw the company build further on its long standing relationship with Transition Therapeutics with the out-licence of the phase II ready selective androgen receptor modulator TT701 to Transition. Lilly receives a contingent $1m upfront, with up to $100m in milestones and single digit royalties. The deal flow with Lilly reaches back to March 2008 with Transition's gastrin based therapies (potential disease-modifying therapies for patients with diabetes) including the lead compound TT-223. Under this agreement, Transition received a $7m upfront, with up to $130m in milestones, as well as royalties. Both parties participate in the clinical development in T2 diabetes. On to June 2013 and Lilly exercised its option to develop and commercialise the anti-diabetic drug candidate TT-401. In an interesting deal structure, Transition received a $7m milestone and the agreement was amended so Transition would contribute $14m to Lilly over the course of the phase II clinical study. In return, if successful Transition would then receive an additional $240m in milestone payments plus double-digit royalties. This was quickly followed in July 2013 when Transition secured an exclusive global licence of worldwide rights to TT-601 a phase I ready novel small molecule transcriptional regulator for the treatment of osteoarthritis. Lilly retained an option to reacquire rights to TT-601 following the PoC study results. If exercised, Transition would receive $130m in milestones and a high single-digit royalty. If not exercised, Lilly is in turn, eligible for a low single digit royalty from Transition. Clearly a very successful and creative partnership! Choosing to opt for partnership over an acquisition, J&J closed a multiple licence with Achillion to build on its hepatitis C portfolio. The agreement covers ACH 3102, ACH 3422 and sovaprevir. The intention is to trial a combination of ACH 3102 with a NS3/4A HCV protease inhibitor plus an NS5B HCV polymerase inhibitor. ACH 3102 has been granted fast track designation by the FDA. The deal includes an equity investment of $225m plus milestones of up to $1.1bn and tiered royalties. Keeping in the headlines, Pfizer secured a minority interest in the company AM-Pharma with an option to purchase the remaining equity in the company. The option is exercisable on completion of the phase II studies in acute kidney injury related to sepsis. The purchase included an $87.5m upfront with $512.5m on exercise of the option. Following the collaboration announced in June 2014 with Cellectis, the rumours are now going around that Pfizer may be planning an acquisition with an estimated price tag of $1.6bn. Watch this space! Finally, we noted in the Annual Deal Watch report for 2014 the emergence of the trade in priority review vouchers (PRVs). A PRV is a transferable asset issued by the FDA to a company who obtains approval for a treatment in a neglected disease. Sanofi has been adept in this area with its previous access to a PRV for Alirocumab for dyslipidaemia (in partnership with Regeneron who had originally purchased the PRV from Biomarin) for which together theypaid $67.5m in July 2014. Sanofi purchased the paediatric PRV from Retrophin for the total consideration of $245m ($150m on closure with two subsequent payments in 2016 and 2017 of $47.7m). The paediatric PRV was issued when Cholbam was approved for the treatment of patients with peroxismal disorders. Overall, May proved to be quite an eclectic mix of deals, not only with PRVs but a wide range of therapeutic fields - CVS, CNS, respiratory, dermatology and rare diseases; it will be interesting to see what June has to offer!